A Wide Line: Quinn’s Weekend Adventures: New Blog Feature! 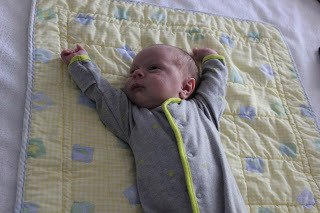 Quinn’s Weekend Adventures: New Blog Feature! Welcome to my new weekly blog feature, Quinn’s Weekend Adventures. I will take pictures of Quinn every weekend, documenting his antics and activities, and I’ll post them here every Monday. This will force me to update the blog and take more pictures of Q. Plus, Q’s friends and family (and maybe my other readers, too) will enjoy new photos with much greater frequency. 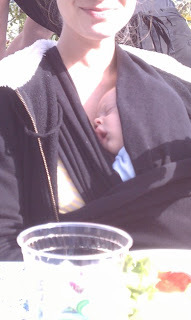 This past Saturday, we took Quinn to the Half Moon Bay Brewing Company (a.k.a. The Brew Co.) Matt and I used to come here almost every weekend. We even had our wedding dinner here, after getting married on a nearby beach. With the outdoor fire pits and friendly people with their dogs, The Brew Co. is a great place to hang out on a lazy Saturday afternoon. This weekend, we sat outside with Quinn and enjoyed the sun, a burger and some good beer. I had my first dark beer in what seems like forever! Quinn was happy to be snuggled up against me, protected from the sun and wind. He’ll enjoy this place more as he gets older. Q also got his first glimpse of the Pacific Ocean, just across the street from the Brew Co. I think we’ll come here a lot this summer. We started Sunday out with a bath, which Quinn has come to enjoy more over the last couple of weeks. His first couple of baths were traumatic. (Q didn’t like them either.) But now, he doesn't mind being in the water. 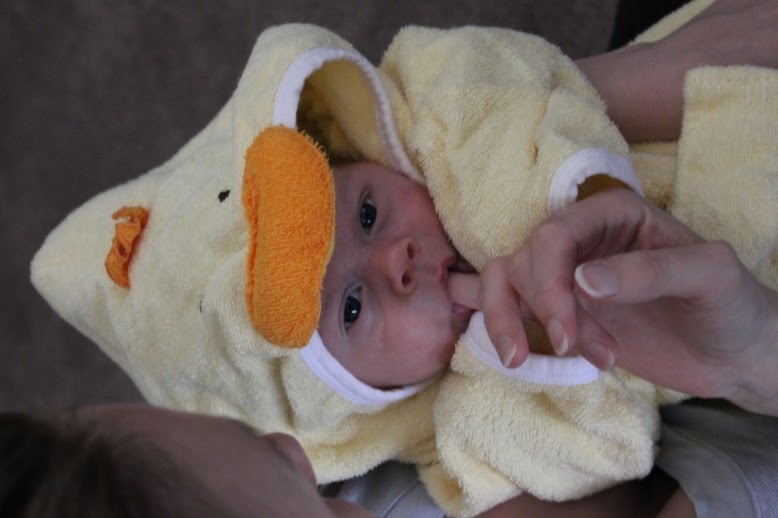 He still has some room to grow into his super cute ducky bathrobe. Then we took our freshly cleaned baby to see Poppa Steve and Nama (Grandma) Mary. 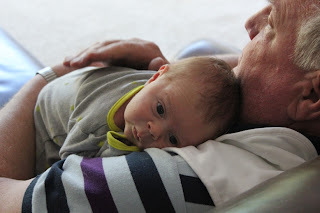 Poppa Steve hadn’t gotten to hold Quinn in a while, and Q happily accepted the extra snuggles. 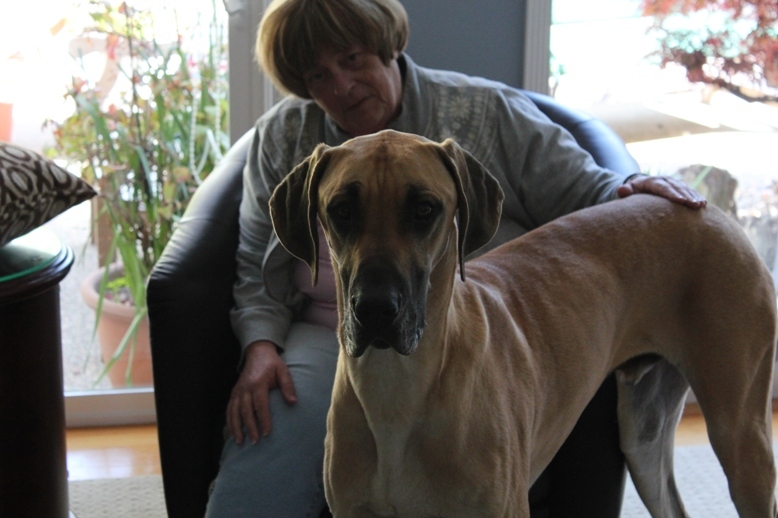 Duke, the gigantic Great Dane, expressed his concern over Quinn’s cries during a diaper change. 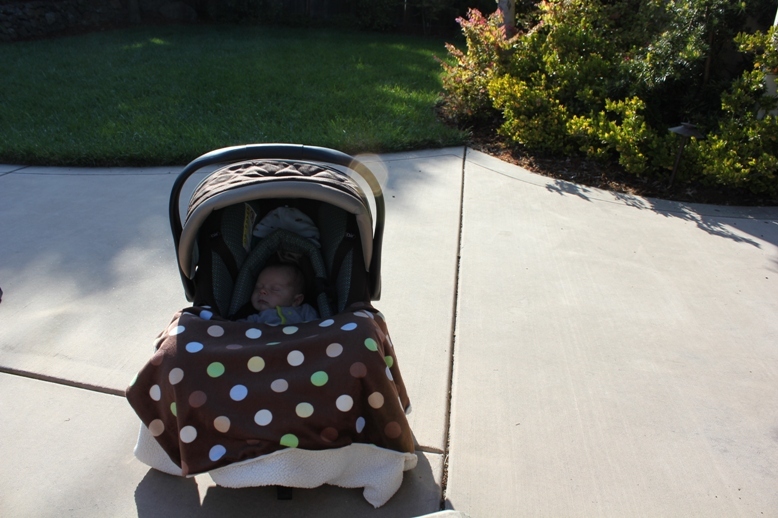 Once we got home, with Q sound asleep in his car seat, the three of us enjoyed some time in the backyard together. Don’t worry, Q was well shaded. Then it was time for bed. How big is Quinn? SOOOO big! I think that your weekly blog feature is an awesome idea! He will change and grow so much over the coming weeks that it will be amazing to see. I wish I would've tried that when our guy was still so little. He's 10 months old now...babies grow so quickly! Enjoy every moment of your journey! Wow, thanks, Cynthia! That's so nice of you. I'm so glad you like the blog, and I really appreciate the comments.